Micron Metal Finishing has a state of the art 75,000 sq ft facility in which we house some of the newest technology in the powder coating industry. 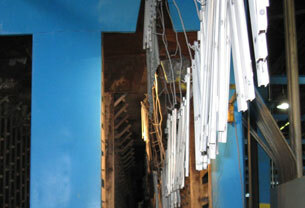 We have three conveyorized powder coating lines that can handle parts up to 10ft long and as small as nuts and bolts. Our production lines consist of Nordson spray booths with reclaim technology. What this means to you is that we can maximize our effencies and pass along the savings to our customers. We also have 2 batch booth systems that allow us to complete samples, and small runs in the the time frame to meet the most demanding schedules. With over 650 colors in stock we can satisfy even the shortest of lead times. Anything from textures to smooth finishes and full gloss to matte finishes we can coat them all. With our large lines able to handle parts as large as 39” x 95” x 120” and our batch line able to handle parts 48” x 60” x 84” we can handle all of your needs. Along with our powder coating services we offer many value added services to make Micron Metal Finishing your one stop shop for your metal finishing needs. Such as masking, silk-screening, fulfillment and direct Shipping, strategic alliances with E coaters and Platers. 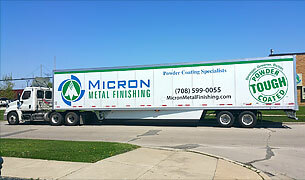 Let Micron do your packaging and light assembly of parts right as they come off of the coating line. No need to transport them to a separate packaging facility. Here at Micron we have a dedicated team and line to handle all off your packaging and light assembly needs. From the initial contact until the last part is shipped our number one goal is customer satisfaction. To be able to realize that goal we here at Micron have put in place an experienced customer service team that can take care of all your questions and concerns in the most timely fashion. We also have a fleet of trucks that can pick up and deliver your parts to the location of your choice. The advantage of having our own trucking fleet is that we can be flexible with the timing and location of the pickups and deliveries.